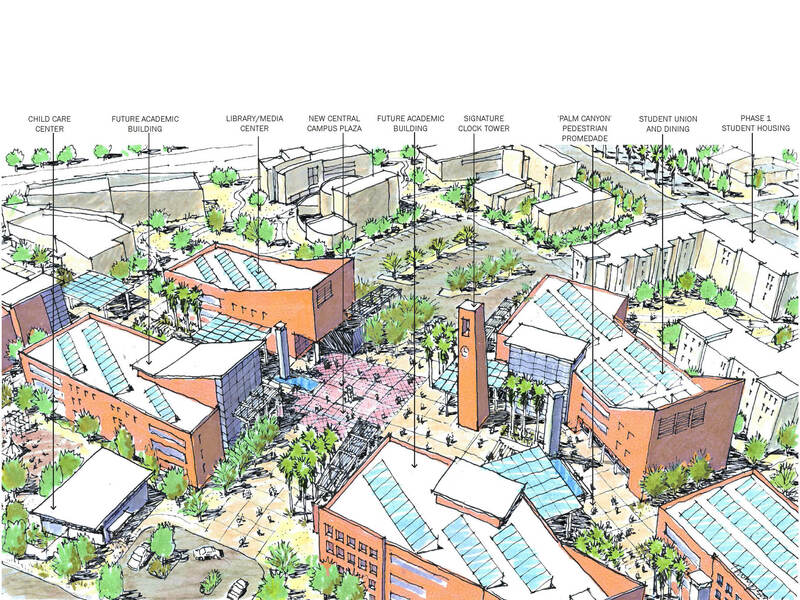 The master plan for the satellite campus of California State University, San Bernardino in Palm Desert addresses the campus’ physical needs and establishes an organizational structure for growth, using state-of-the-art “Performance-Design” techniques to create a sustainable environment in an arid desert climate. 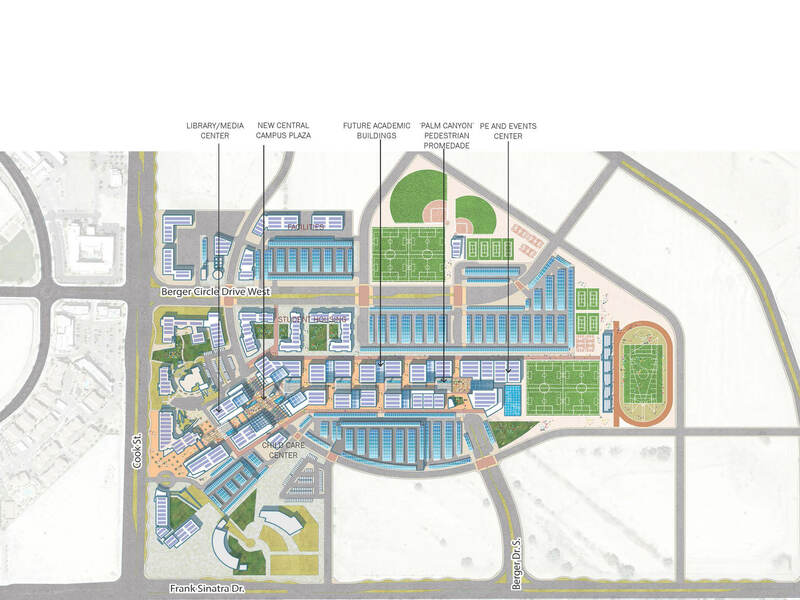 The key goal of the plan is to guide the growth of the campus from 1,000 to 8,000 students and provide a complete 4-year University to serve the Coachella Valley. 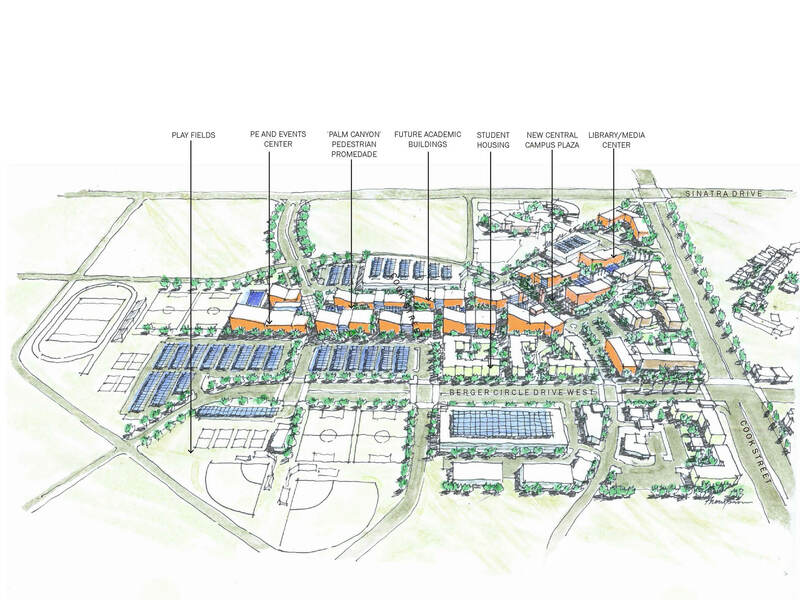 To accommodate 8,000 FTE, the plan concentrates students within a compact 85-acre area of the overall 169-acre site, incorporating existing campus grounds and structuring the bulk of campus growth eastward while reserving remaining portions of the site for other future joint development opportunities and future growth of the campus beyond 8,000 students. 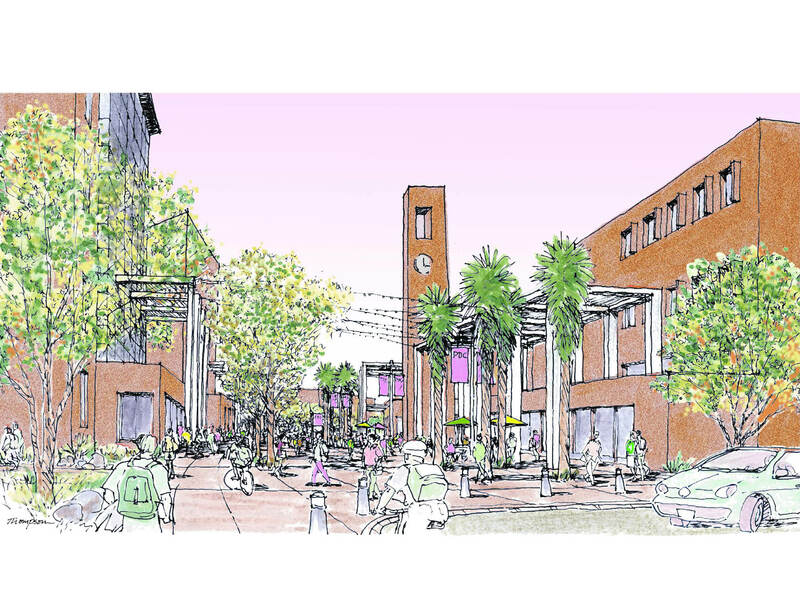 The master plan envisions an organizational framework linking the existing campus to future campus development along a new pedestrian spine. 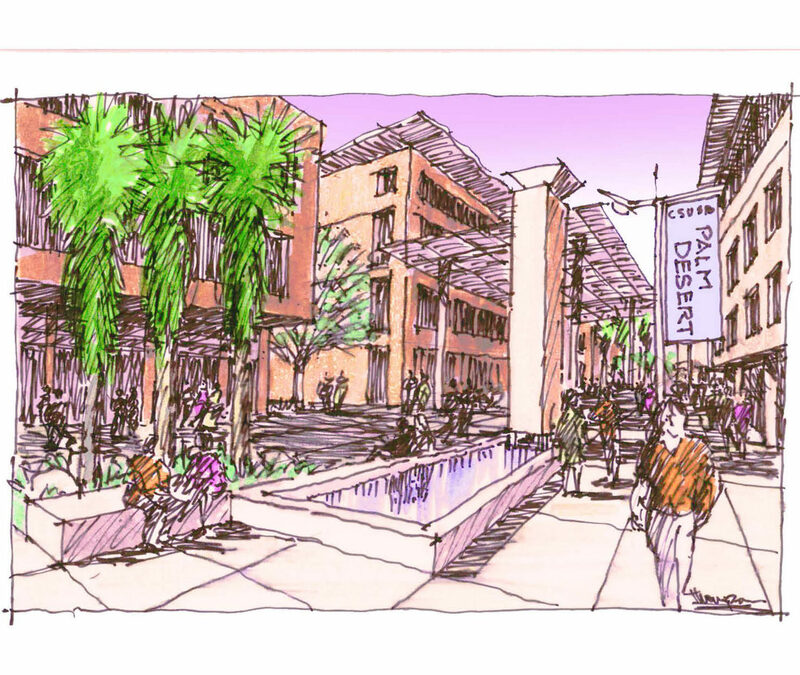 The concept of a central pedestrian promenade, ‘Palm Canyon Walk’ is modeled after a local ecological system known as ‘Palm Canyons’ that are formed when water is found in small canyons off the desert floor. Over time these canyons became densely populated with palm trees creating a cooling natural oasis setting. 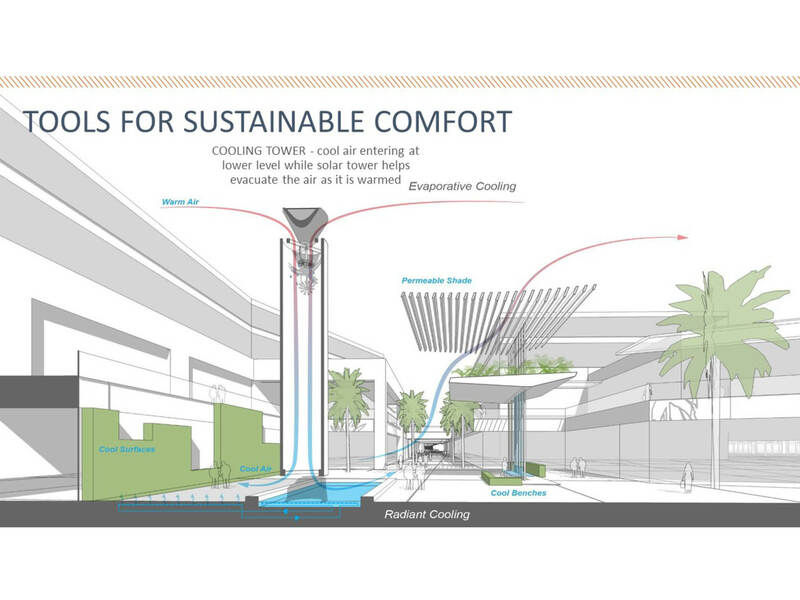 Using ‘Performance-Driven Design’ and other sustainable design strategies the plan achieves the same effect of reducing the ambient temperature by 10 to 15 degrees. Buildings on both sides of ‘Palm Canyon Walk’ are oriented to maximize shade, reduce heat gain, and provide wind protection when needed. Adding sustainable elements such as evaporative cooling towers and shade structures (both permeable and solar) provide pleasant outdoor settings for student activity and gatherings. Responding to the existing desert context, the master plan creates a dense campus environment to reduce walking distances and provide usable outdoor student gathering spaces that provide protection from the intense heat and wind. Working closely with the City of Palm Desert as they concurrently prepared a Specific Plan for the neighborhood surrounding the campus, the Plan provides new connections to neighboring communities and incorporates the Specific Plan’s recommendations for reducing traffic lanes on Cook Street with landscaped medians, bike lanes, and/or parking in order to improve pedestrian safety and to establish a distinctive gateway to the University neighborhood. 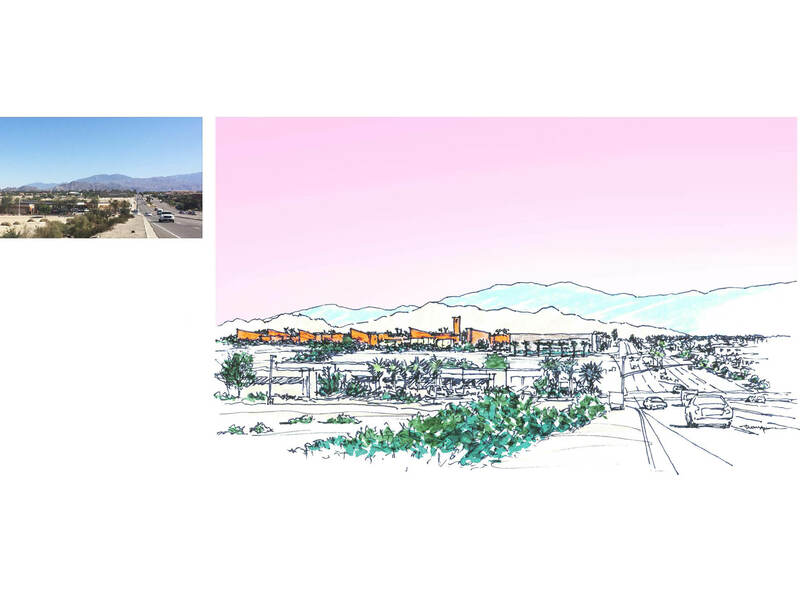 The Cal State San Bernardino Palm Desert Master Plan received the Best Practices Merit Award from the American Planning Association, Inland Empire Chapter.